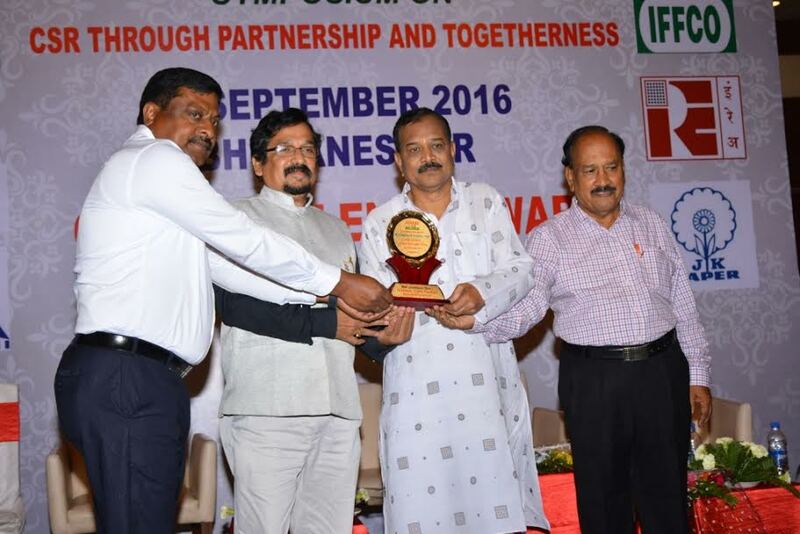 Angul based Jindal Steel & Power Ltd (JSPL) has been awarded with Best CSR Practice Award by Odisha CSR Forum, a leading non profit organisation engaged in promoting CSR in the State. The award was presented by Finance & Public Enterprises Minister of Odisha, Mr. Pradip Kumar Amat on Saturday at Bhubaneswar during the Symposium on Start Up India and Stand Up India, being organised by the Forum. On behalf of JSPL, Mr. Prashant Kumar Hota, Executive Vice President & Group Head CSR & Education and Mr. BP Mishra AVP (Corporate Affairs) received the award, in presence of Convenor of the Forum Mr. BK Mishra and other dignitaries. Thanking the organisers and jury, Executive Director (I/C) of JSPL, Angul, Mr Dinesh Saraogi said, “we have initiated several long term and strategic effort to improve the quality of lives of people, especially in our periphery area in the avenues of Community Health, Mass Education, Natural Resource Management & Sustainable Livelihood Options . I am sure Odisha CSR Forum’s coveted Best CSR Award will further inspire our social development initiatives steered by Smt Shallu Jindal , President , JSPL Foundation ”. Mr. Manish Kharbanda, JSPL’s Executive Director & Head of Odisha Corporate Affairs attributed the award to the persistent dedication of JSPL’s CSR Team in pursuing the Nation Building Vision of JSPL’s Chairman Sri Naveen Jindal ..
A three member Jury consisting of Former MD, Neelachal Ispat Nigam Mr. P.K. Mishra, Former ED, HAL Mr. K.C. Nanda and Former HOD, CSR Rourkela Steel Plant Mr S.N. Patro has selected JSPL for the Best CSR Practice award on the basis of the quality of ground implementation , project impacts and social endorsement of the Company’s multidimensional CSR Projects in the area of controlling adolescent anemia of 25000 girls in Angul district, Control of Soil erosion& Recharge of ground water in Watershed Project over 3750 acres , doubling the farm income of the farming families and providing community teachers in vernacular medium schools . For its innovative CSR interventions JSPL has been awarded with Greentech CSR Award, Golden Peacock CSR Award, OTV CSR Award, Odisha Living Legend Award, Odisha Environment Congress Award and several others.